However (… there’s always that however somewhere, huh …) earlier this year, I started having severe hip joint pain and found myself in for two visits with my GP (General Practitioner) within two months in hope of hip joint pain relief. Not being one to run to the doctor for every ache and pain, I found having to do this to be rather annoying, to say the least. The Doc just kept shrugging my complaint off though this is normal pain to have to suffer with. Guess he doesn’t know me that well … yet. I’m not one to complain unless there is a REAL issue. As time progressed into early summer the hip joint pain became worse. I could no longer walk my dogs the just over 2 miles daily that I did last year. Now I was finding myself having to use joint pain relief medication, and I’m not a ‘big fan’ of using medication … unless I have no other choice. Once the daily dosage became well beyond my comfort level, I contacted my GP’s office again, asking for an MRI too see why my hip joint pain had become worse. My GP insisted on sending me to a “Specialist” to see if my complaint of hip joint pain warranted my having an MRI on my hip. Well, turns out that specialist is a relatively new label for a joint replacement surgeon. YIKES! This specialist insisted I need a total hip replacement … and I nearly fainted. Turns out, there is a fair sized arthritic cyst on the ball part of my hip joint and it is NOT going to go away anytime soon. Not sure if you have ever seen any of those videos on YouTube or not, but a total hip replacement appears to be no ‘picnic’ … and watching an animated version made me dizzy, and very queasy. Saying that I became hysterical (crying privately) after watching this would be an adjective you could use, yup. In the meantime, I called a dear friend (whom I shall refer to here as Sue, but that is NOT her real name) of mine who has been in for a total hip replacement AND a knee replacement. Sue is VERY knowledgeable on natural joint pain relief products, so, with pencil and paper in hand, she suggested I give Curcumin Active Fast Relief a try … and, I was to make certain to purchase only the AOR brand. Seems there have been too many different formulas for curcumin on the market now but this AOR brand is being touted as THE best by our local health food store too. Anyway, Sue told me that she used this curcumin in place of her pain medication when she had her knee joint replacement … and, she tells me that a total knee replacement is a LOT more painful than a total hip replacement. I was quick to reminder her that I’m hoping to delay my ever needing a total hip replacement until, ooooh I dunno’ … until it’s time for me to leave planet earth would be soon enough, don’t you think. There are lots and lots of websites persuading their visitors that the best joint pain relief products are “sold here” but, after purchasing and using this Curcumin Active Fast Relief by AOR, I’m SOLD on this stuff. After chatting again with Sue, I learned that she used to take 2 capsules of curcumin every 2 hours in place of the knee replacement surgery drugs she was given. Silly me … and here I had been taking 2 capsules in the morning but turning to joint pain relief medication when my hip started hurting hours later. So, now that I’ve learned I can safely take more than the 2 in the morning … I do just that in place of the medication… and it WORKS. The pain leaves me so quickly that well … I forget for a ‘spell’ that I even HAD the pain in the first place. If you ask me which joint pain relief products are most effective and what is the best joint pain relief supplement, I’d recommend you try Erin’s recommended brand of SierraSil and if you find it doesn’t work, than Sue’s recommended brand of Curcumin Active Fast Relief. 2) my body’s central nervous system became accustomed to this supplement. 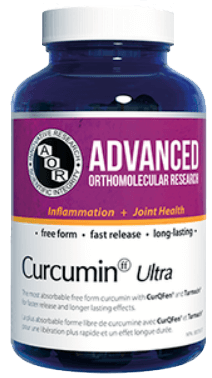 UPDATE: 16 June 2018 – Have now switched up to using AOR Advanced Orthomolecular Research Curcuminff Ultra as I found I was having to take soooo many capsules daily of the AOR Curcumin Active Fast Relief that it was no longer financially feasible to continue using. And most definitely not as convenient, given that I was taking up to 6 capsules (2 each time throughout the day) of the Active Fast Relief daily as apposed to ONE capsule of the Curcuminff Ultra. Can eating turmeric-based curries, increase curcumin levels in the blood? If you’ve found a better supplement, or that you have found this post helpful, either way, I would sincerely appreciate your commenting below.